Individuals who had no idea of what was involved in running other functions suddenly have empathy for their counterparts in these groups. To a person, they develop an enhanced understanding of how difficult it is to coordinate the myriad decisions across a business and drive positive and ever-improving results. Every person involved develops an understanding of why strategy is important. Although we teach and encourage the teams to select a strategy, monitor competitors and then to adapt and adjust accordingly, almost every team ignores this advice. The result is painful for some teams who manage to destroy what started out as a healthy business. In the final debrief after reviewing the lessons learned in great detail, ask a question that shifts the entire discussion: “How much do your employees need this same education?” After a momentary silence, it dawns on them that everyone is likely in the dark on how the business operates and every person must understand the firm’s strategy and the process for coordinating decisions to drive desired outcomes. 1. Understand the game plan. Ask your boss to share the and goals with you and Encourage your team members to ask questions about how their work ties to achieving the goals. 2. Lower the gates. Regularly invite representatives from other functions to attend your team meetings. Ask the representatives to help inform your team members about the priorities and challenges of their particular function. If appropriate, set up a tour for a future date. And make certain to reciprocate so that you are able to share more about your function with other groups. 3. The truth is in the market. Repeat the information sharing step above, but emphasize inviting individuals who have direct contact with customers, partners and competitors to help educate your team on the realities outside the walls of the business. If possible, request the opportunity for you and your team members to visit customers or attend industry events. Read and share industry publications. 4. Move beyond your four walls. Challenge your team members to study competitors, customers, and business partners and train each other on their moves, announcements and visible strategies. Connect these insights to possible ideas for improving your firm’s position in support of customers or in response to competitors. 5. Turn insights into actions. Move beyond information sharing with your functional counterparts to examining processes where your groups interact. Work together to identify bottlenecks and areas where handoffs are occasionally botched, and create improvement plans to resolve these issues. Measure the results over time and create joint celebrations when goals are achieved. 6. Understand the numbers. Strive to understand the measures and metrics that are monitored to evaluate the financial health of the organization. If needed, train yourself or seek training in understanding the meaning and derivation of the numbers. You do not need to become an accountant to cultivate an understanding of various accounting terms and measures. Share this knowledge with your team. 7. Learn the score. If your firm has a scorecard, where it tracks measures outside of financial, such as quality, customer satisfaction, net promoter score or employee engagement, ask your boss to share this scorecard and educate your team on the metrics. Importantly, tune in to those measures that you and your team members directly or indirectly affect and align your goals and activities to drive improvement in those measures. 8. Speak up and ask. Start asking questions at company meetings and town hall events where the firm’s financial results are discussed. 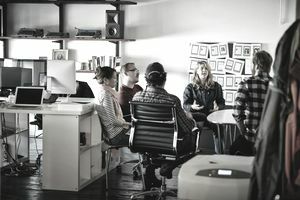 Executives love questions on strategy, direction, and how the current plans are intended to impact future results, although employees are mostly silent at these events. The purpose of the business at its most basic level is to acquire and keep customers. However, for many of us operating far removed from the front lines or executive ranks, we have little understanding or appreciation for the myriad activities that must be coordinated to generate positive results and continuous improvement. Business is a great game as Jack Stack suggests and your ability to understand the rules, players and the game board ultimately impacts your success. It is time to get in the game.